This is the final report of the 2018 bloom season. The next scheduled crop progress report will be posted on Monday, March 19, 2018. In the event of any significant occurrences prior to that date, this site will be updated as soon as possible. 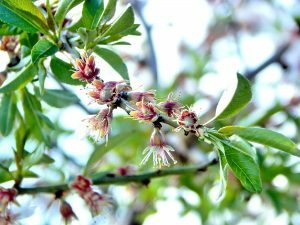 Bloom has come to an end throughout the state. 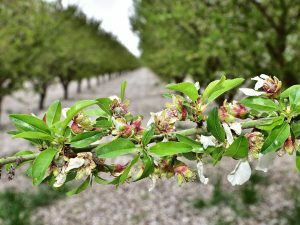 While select Butte and Padre orchards have a few viable flowers remaining, the vast majority of orchards have no viable flowers left in all varieties. 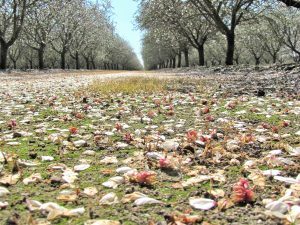 Windy conditions in all regions on Saturday removed what was left of the viable flowers In Nonpareil, Carmel, Monterey, and California type pollinizers. 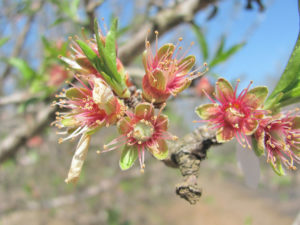 Nutlets are beginning to emerge in the early blooming Sonora and leaves are emerging in all varieties. Friday and Sunday saw daytime highs in the 70s with very little wind. 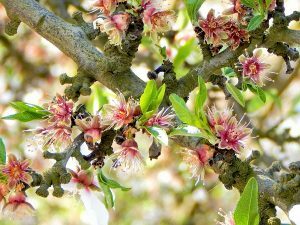 Bees were able to work at least 6 hours both days where viable pollen remained. By the end of Sunday bees were moving on to other sources of pollen. Bee keepers have started collecting hives and shipping them out of the state. With rain in the forecast for most of the week, growers continue to apply fungicides for post bloom diseases. 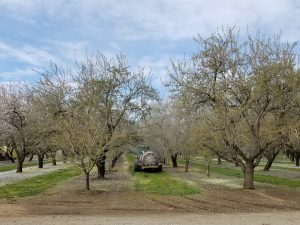 In the coming weeks growers will begin to fertilize and irrigate their orchards as trees begin to shed excess buds and leaves continue to emerge. 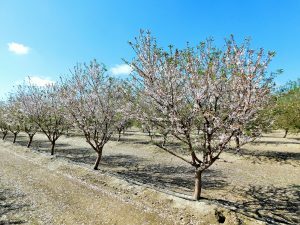 Crop evaluation will begin in earnest after the excess buds shed at which time the extent of the frost damage earlier in bloom will become apparent. Wind: 5 mph. Gusts up to 10 mph. Bee Activity: 7 hours of very good activity. Sky Conditions: High, thin clouds. Wind: 2 mph. Gusts up to 10 mph.